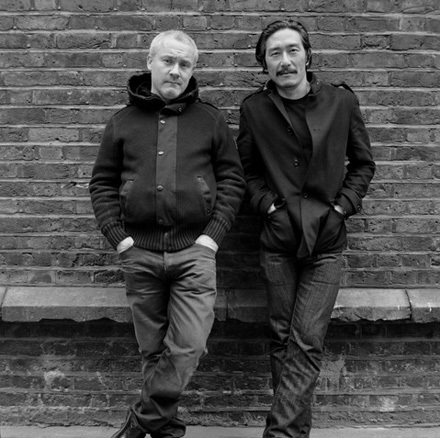 Damien Hirst and Michael Joo, 2010 © Damien Hirst/Hirst Holdings Limited and Michael Joo 2010 via Other Criteria, photo by Johnny Shand Kydd. On view at Haunch of Venison, Berlin, “Have You Ever Really Looked at the Sun?” is the first joint exhibition of Damien Hirst and Michael Joo, two artists whose often-controversial mediums (animals, a diamond-encrusted, platinum skull, urine) have offered convenient comparisons since the late 1980s. This exhibition displays both new and canonical works in a manner that allows the works’ conceptual interests to flourish, despite—and in conversation with—their formal similarities. 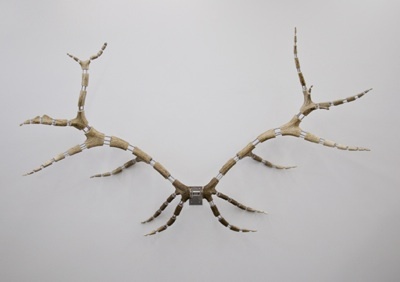 Hirst and Joo began engaging nature in their distinct artistic languages early in their careers. Hirst’s seminal Physical Impossibility of Death in the Mind of Someone Living (1992) consists of a tiger shark in a glass tank of formaldehyde, while Michael Joo’s Salt Transfer Cycle (1993-95), a three-part video work, shows him swimming through MSG, crawling and running on biographically significant salt flats, and finally spending 13 days in a South Korean forest, awaiting an elk to become comfortable enough with Joo to be able to lick the salt from the artist’s body. Installation view via Haunch of Venision. Installation view via Other Criteria. 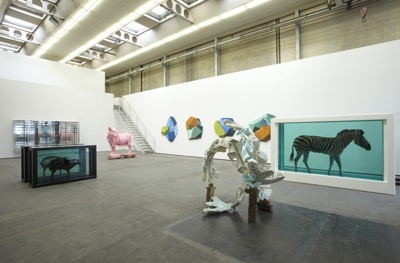 In “Have You Ever Really Looked at the Sun?”, similar works are self-consciously collocated, as Joo’s pink-coated bronze zebra sculpture, Doppelganger (Pink Rocinante) (2009) seems to look at the haunches of Hirst’s formaldehyde tank-bound zebra in his The Incredible Journey (2008). 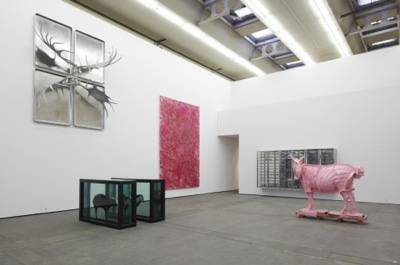 Joo’s zebra, the complete bronze cast of the mold for another piece—the two shown as a pair at Anton Kern Gallery in 2009—is made a syrupy pink monochrome, an action that articulates Joo’s preoccupation with identity and entropy. 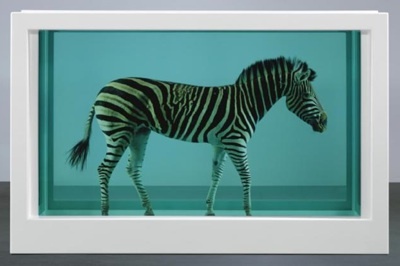 Hirst’s zebra, sold in his direct-to-market auction via Sotheby’s during a peak in the financial crisis in September 2008, is literally a stoic zebra, preserved expressionless. 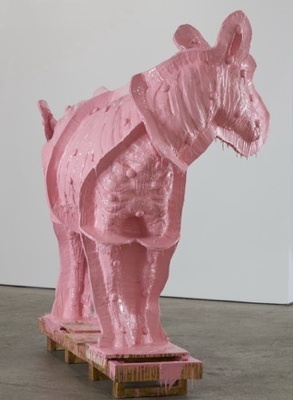 Michael Joo, Doppelganger (Pink Rocinante), 2009, bronze, enamel, paint, 77 x 76 x 44 inches © Michael Joo, image via Haunch of Venison. Damien Hirst, The Incredible Journey, 2008, zebra, glass, steel, silicone, formaldehyde solution, 82 x 127 x 43 inches © Damien Hirst/Hirst Holdings Limited, via Sotheby’s. 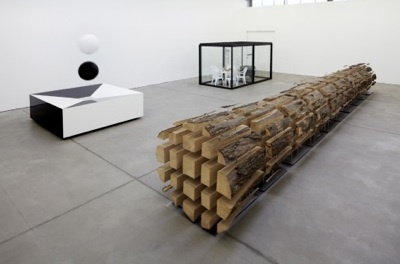 Both pieces’ titles, referring to allegorical novels (such as: Rocinante, the horse of Don Quixote, among others, and Shiela Burnford’s Incredible Journey, the 1961 story of two dogs and a cat struggling through the wilderness back to the protection of their human home), form an almost comical framework for Hirst and Joo’s disparate conceptual focuses. 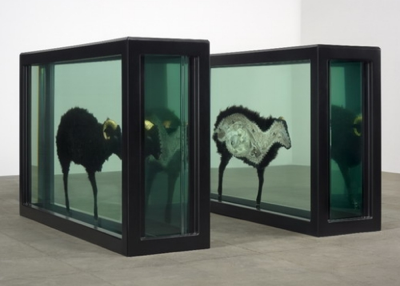 Joo’s invocation of nature as a way to marvel at and codify disorder play with floating systems of meaning and context, alternately stroking and bristling Hirst’s animals—their gazes shifting between monolithic to effaced to defaced, thus complicatedly positioning the viewer in opposition. 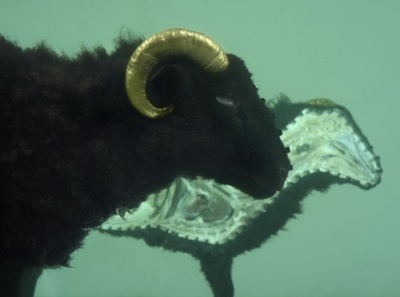 Damien Hirst, The Black Sheep with Golden Horns (Divided), 2009, (detail view) © Damien Hirst/Hirst Holdings Limited, via Haunch of Venison. Damien Hirst was born in Bristol, England, in 1965. While attending Goldsmith’s College, he curated a student exhibition entitled “Freeze” (1988), which sparked his relationship with the Saatchi Gallery. Now represented by White Cube Gallery in London and Gagosian Gallery in New York, Hirst lives and works in London and Devon, England. Michael Joo was born in Ithaca, New York, in 1966. He attended Wesleyan University and Washington University, earning his MFA from Yale School of Art, Yale University, in 1991. Represented by Anton Kern Gallery, New York, his works are held in collections at Museum of Modern Art, New York, Guggenheim Museum, New York, FNAC (Fonds National d’Art Contemporain), Paris, and Walker Art Center, Minneapolis, among others. He lives and works in New York, NY. Hirst and Joo have been friends since 1991. This entry was posted on Sunday, June 20th, 2010 at 1:00 am	and is filed under Go See. You can follow any responses to this entry through the RSS 2.0 feed. You can leave a response, or trackback from your own site.